Last night in cities, towns and tiny villages all over France, music and singing celebrated the summer solstice. The Fete de la Musique has been an annual event in France since 1982, bringing free music to millions of people. I posted here about the small group of women that I sing with. 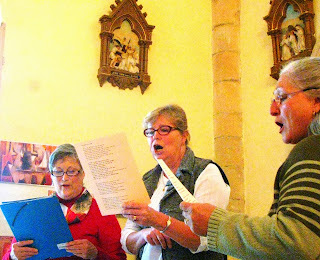 Last night was the culmination of our winter's work...a concert at the little church in Seuzac. We began the evening with a trio of traditional French songs: Pas d'Argentine, Margot, and Serenade by Gounod. 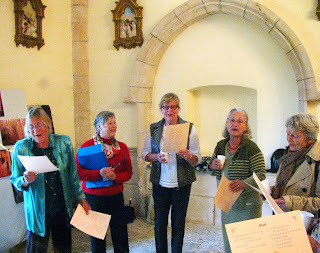 Then we went into a selection of several sacred and secular songs in Latin, Spanish, Georgian, Hebrew and Bulgarian. (No, I don't speak any of those language...it's all done with phonetics and I don't have a clue what the words mean.) With a nod to the sole American in the group, moi, we next sang Swing Low, Sweet Chariot. Moulin Rouge and Alleluia israeli completed the first part of our program. Everyone enjoyed a glass of white wine with nibbles during the intermission. Aperos are part of every French gathering! While we sipped, we began the second half of the evening with Ah! le petit win blanc.(Ah! a Little White Wine) and handed out song sheets, inviting our audience to sing along to such favorites as Je chate!, Boum, and La Boheme. We even channeled our inner Edith Piafs with La vie en rose. Even the men enthusiastically joined in. We closed with Dona Nobis Pacem sung in canon with our guests. A lovely evening and a joyous way to greet summer. Now all we need is some sun! **Thanks, Greg, for taking the photos. Rather too many wooly jumpers in evidence for mid summer's night. 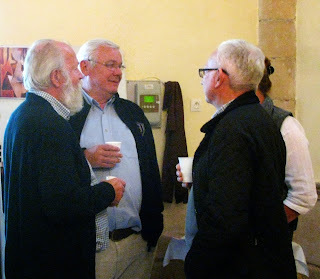 At Limogne the choral session in the church got a huge audience, due to a downpour outside! Good evening though and people turned out in huge numbers despite the weather. This looks like fun! What a great way to bring in the summer....hope all is well in France. I keep getting the message that I need to go there. If I do, I'll let you know ^_^! It sounds great and good fun - I am amazed at how well you have integrated in such a short time. Our Parisot Choir is performing next Sunday (30th June) in the Church at Parisot at 8.30 - our last concert of the season before our summer break. We have a great time and it's an international effort. 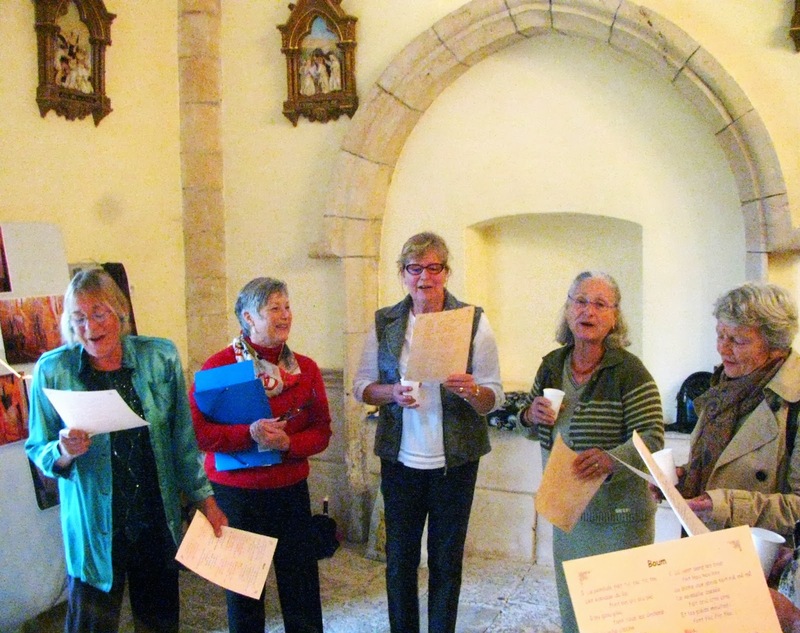 However, singing in a smaller group, as you do, sounds like a very rewarding experience.